There are many software packages for writing screenplays, but the undisputed industry leader is Final Draft. Far more than a word processor, Final Draft includes formatting, versioning, structuring and even copyright-registering tools. The idea is simple. 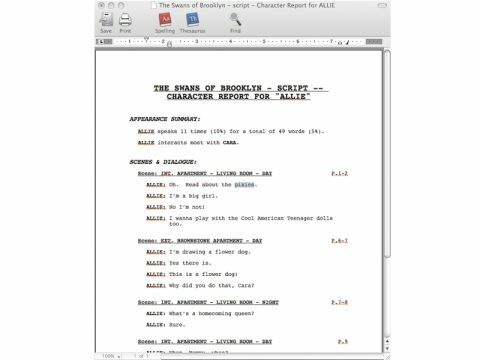 You break your script down into scenes using one of the built-in templates, formatted in the standard script style, complete with 'mores' and 'continueds' at breaks, scene headers and title pages. Final Draft lets you keep track, reorganise, tag and colour-code scenes, and write 'index cards'. Also, if you need more scenes, just insert them, detailing what needs to happen but leave them blank until you get round to writing them. The program also has many minor assists, such as character-name autocompletes and a names database. There's a Reports function, which tells you which characters and locations get focused on the most. Since writing doesn't stop with the screenplay but continues on-set, there are also some useful versioning and formatting tools so you can omit, lock and colour-code scenes according to revision number. A standalone application, Final Draft Tagger, lets production staff tag items in scripts such as costumes, then export them to scheduling applications. Commanding £170 (or £160 for the download version) and used by everyone in the business, Final Draft 8 has rested on its laurels in recent years, particularly the Mac version. But version 8 is an eye-opener. As well as adding some useful new features, the developers have stepped away from their previous approach of making everything look the same on Mac and Windows, so now everyone feels at home. The interface is now far more Mac-like, with brushed metal windows and an OS X-standard customisable toolbar. There are also two new palettes for managing structure and metadata. A Scene Properties Inspector (SPI) and a Scene Navigator. The former lets you add information to scenes, while the Scene Navigator provides an easy way to view and sort the information and jump to pages. The index cards are 'double sided' so you can view the additional info and then organise scenes by drag and drop – you can do a similar thing with Scene View, which gives you a list of scenes, with any information you've added. You can now also split the screen to view notes and script side by side. Also new to version 8 are improved templates, and a better spellchecker and a thesaurus. A new workspace preference lets Final Draft open all the files you had open, in the order you were working on them. Printing and PDFing have also been improved. While, the tools and interface of Final Draft are inferior to those of cheaper rivals Scrivener, Storymill, Contour and Montage, this tool has the pros in mind and it's with production that it excels. Newcomers probably needn't splash out on it, seeing as other programs can export to the FD format. But to old hands, the new tools are a must-have.